Arriving this Wednesday at Sports Cards Plus, a.k.a. The Super Hit Factory is 2017 Panini XR Football ($94 per box), making its debut with some bold designs and a balance of big hits and other inserts. Hobby boxes come with a pair of autographs including one signed memorabilia card from the 2017 rookie class. A third hit comes in the form of a memorabilia card. Other box hits include one insert and a quartet of parallels. The main part of the 2017 Panini XR Football checklist has 200 total cards. Half of that is dedicated to the shell base set. Next are 60 rookies. Limited to 299 copies or less, rookies combine to land two per hobby box. The final 40 cards are Rookie Triple Swatch Autographs. These are all numbered to 199 or less. From a design perspective, 2017 Panini XR Football is printed on holo-foil. A coating gives them a matte finish. Every third pack includes a parallel. Rookie Jumbo Swatch Autographs are among the premium cards in 2017 Panini XR Football. As the name suggests, these come with large swatches as a centerpiece. However, it’s not just jerseys. Things like player-worn gloves are also used on select cards. Base versions are numbered to 199 or less with parallels coming in at even smaller quantities. Dual and Triple Autograph Swatches are randomly inserted, mixing ink and memorabilia from a rookie with a veteran. These are tough, limited to no more than 20 copies each. Luminous Endorsements (/99 or less) take a shadowbox approach to autographs. On the strictly memorabilia side, options include Team Trios Materials, Maximal Materials and Rookie Jumbo Materials. 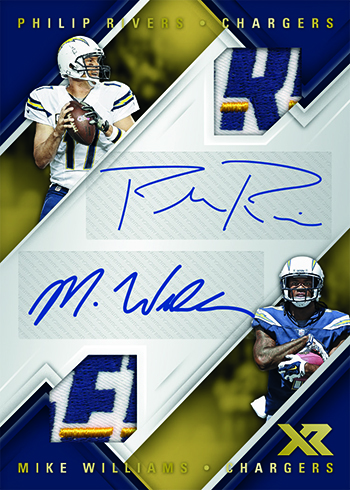 According to Panini, each cards of 2017 Panini XR Football has a one-of-one autographed memorabilia card. As far as other inserts go, collectors can expect to find at least one per box numbered to 99 or less that doesn’t have any relics or signatures attached to them.